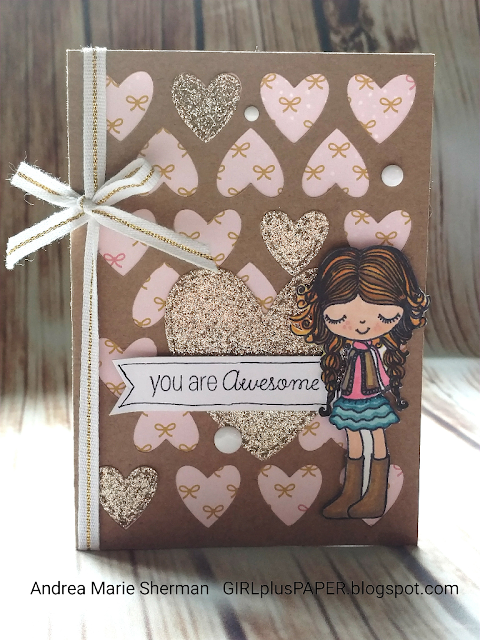 Have you seen the CTMH A Bushel and a Peck Stamp of the Month yet? I am here to show off its cuteness for my stop on the June 2018 Joyful Stars Blog Hop. If you have arrived here by way of Michelle's blog, you are on the right track! Today's card began with a card base cut out of the CTMH Artfully Sent Cricut Cartridge. I thought those hearts would make a darling background for my A Bushel and a Peck girl. It was cut from Kraft cardstock and backed with a little piece of pink patterned paper from the CTMH Documented paper pack. the Thin Cuts - Stitched Hearts die set. I can't help myself, I have been adding hearts to absolutely everything. 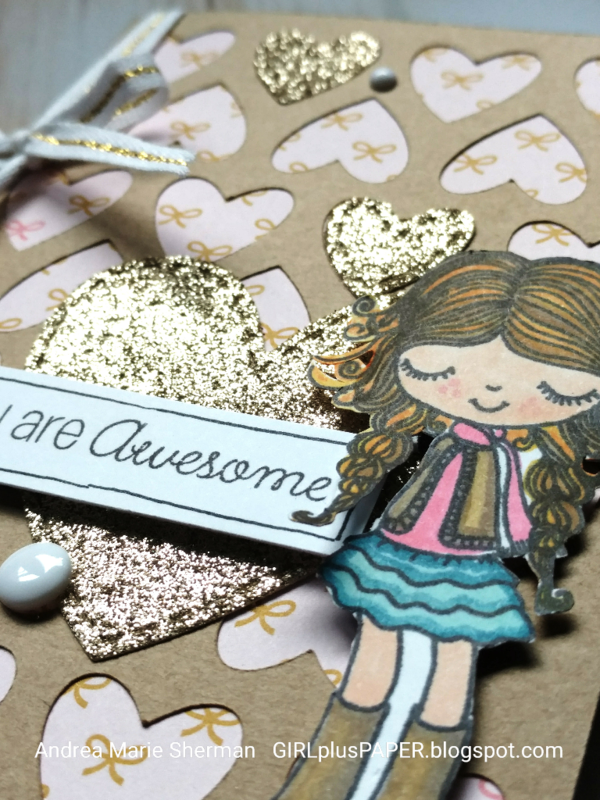 I thought a big Gold Glitter heart would anchor my girl to the card. It worked, but I also discovered something amazing. I added White and Gold Ribbon and White Dots for embellishments. And I almost forgot to mention that my girl was colored entirely using CTMH ShinHan Markers! I love the control that they offer me while coloring! Thank you for stopping by GIRLplusPAPER for this month's Joyful Stars Blog Hop. I hope you enjoy CTMH's A Bushel and a Peck stamp set as much as I do! Next up is my fellow Jersey girl, Marie, at her blog NJ Stamping Queen. What a cute card! I love the heart background! Cute, cute, cute! the heart background is adorable and I love the glitter hearts on the top. Great coloring too! This is really darling! I love the pink background with bows and the beautifully colored young lady. The gold hearts make a wonderful embellishment. Super card! Thanks for inspiring me today!